When we re-experience an event from our past or, in other words, when we access episodic memory, it is accompanied by the sense that we are remembering something. This may not seem like a profound statement, but this simple idea is actually fundamental to our operation as healthy, social human beings. Rimmele et al. (2011, p. 553) describe the feeling of remembering as ”the subjective vividness of the memory, the sense of reliving the emotional event, and confidence in the accuracy of the memory”. It is the feeling it is you remembering something that you have experienced in the past, that the imagery that your mind is producing for you is memory and not imagination. William James (1890, p.239 cited in Wheeler et al. 1997, p. 333) described this feeling as different from the feeling that accompanies other types of thought or imagination. The importance of this feeling is highlighted by cases in which it does not work as it normally would. Moulin et al. (2004) describe two cases where patients were stuck with a constant feeling of remembering even when encountering new stimuli. Situations, people, TV programmes that they had never seen before would feel familiar – as if remembered. Sometimes, to make sense of this feeling, their minds would rationalise through confabulation. For example, when Patient MA saw a woman faint in a restaurant, she claimed to have seen the same lady faint at the beach earlier that day. Cohen and Conway (2008, p. 351) suggest that this phenomenon of feeling as if we are remembering without the act of remembering is experienced by most of us as déjà vu (“already seen”), while more serious cases such as those described above could more accurately be called déjà vecu (“already lived”). What happens when we remember without the feeling that we are remembering? Does this even happen? Jacoby et al. (1989, pp. 396-399) propose that it does, and that memories produced without a feeling of familiarity seem to be new ideas or imaginings. This, they suggest, is what happens in cases of cryptomnesia, where unintentional plagiarism occurs due to thinking that something you have read, seen or heard is your own, original thought. It is not clear how this might relate to memories of our own experience, though I hypothesise that it would lead to a sense of detachment through a reduction in the intensity of subjective experience of recollection, possibly to the extent that we believe that we imagined the scene entirely. James, W. (1890). Principles of Psychology. New York: Holt. Jacoby, L., Kelley, C. & Dywan, J. (1989). Memory Attributions. In Varieties of Memory and Consciousness: Essays in Honour of Endel Tulving. Tulving, E., Roediger, H. & Craik, F. (eds). New Jersey: Lawrence Erlbaum Associates, pp. 391-422. It seems to me that when we take a photograph, it is usually for one or more of the following general purposes: memorial, communicative or creative*. We may not be mindful of our purpose – if you ask someone why they’ve just taken a picture they may tell you that they thought that the subject was interesting, or that they wanted to make a record of something, or that they took it just in case they might want to do something with it later. From my own experience, I will often think that the photo I am about to take will be indispensable, that it will help me maintain a lasting, poignant connection to the subject matter. According to Kahneman, the experiencing self lives in the present moment while the remembering self looks back in order to keep track of the story of your life. When we take a photo, I think that our experiencing self attempts to influence our remembering self by creating a record of what it thinks is important at the time. The trouble is, our experiencing self over-inflates the importance of the present moment due to what Schkade and Kahneman (1998) call the focusing illusion: “Nothing in life is quite as important as you think it is while you are thinking about it” (quoted in Kahneman et al. 2006, p. 1909). Most of the time, our remembering self either looks back at all the records of things we thought were important and selects just a few for its story, or it ignores them altogether and instead pulls out some details from memory to use as anchor points for the construction of a narrative. Aside from a lack of deletion, Whittaker et al. (Ibid, p. 43) found that “in many cases … participants had never revisited photos they had taken years before.” Does all of this show that our experiencing self is a poor predictor of the future needs of the remembering self, or are our photos a tragic attempt of the experiencing self to assert some authority over our life story? In either case, one short answer to my question “why do we take photos” might be: because we exaggerate how much they will matter to us later. Kahneman, D., Krueger, A. B., Schkade, D., Schwarz, N., and Stone, A. A. (2006). ”Would You Be Happier If You Were Richer? A Focusing Illusion”. Science, 312, pp. 1908-1910. Schkade, D. A., and Kahneman, D. (1998). “Does living in California make people happy? A focusing illusion in judgments of life satisfaction”. Psychological Science, 9 (5): pp. 340–346. Whittaker, S. et al., 2012. Human – Computer Interaction Socio-Technical Lifelogging : Deriving Design Principles for a Future Proof Digital Past., (April), pp.37-41. According to Atkinson and Coffey (2011), documents do not just transparently describe reality, they actively construct it. I would argue that documents do not do this independently of the people who create and consume them. Moreover, it is possible – at least to some extent – to exert some control over the direction of this construction. 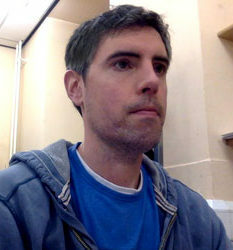 For example, Jonathan Harris’ video “m ss ng p eces” (http://vimeo.com/20729065) shows the potential of photography to help people to feel more connected to a particular aspect of life. Harris wants to live more richly as a “human life”, rather than just as a “work life”, and he takes a photograph every day as a marker of the richness of his non-work experience. It follows that if I want to think more about my recreational reality, I could photograph elements of that reality for subsequent review. I can take a leaf out of Jonathan Harris’ book and start to photograph myself engaging in social behaviour, with my friends, in my social environment. Perhaps I will even amend my behaviour to create opportunities for more interesting photos, thereby constructing, with the help of photos, a richer, more active and more diverse existence. Around the 5:33 mark, Harris describes this increasingly active aspect of his self documentation, alongside some reservations about concession of control to the documentation process. But which memory does he feel is atrophying? Is it his biological memory that is atrophying due to a lack of stimulus? Is it his “digital memory” which, like a person with retrograde amnesia can only remember the more distant past (when he recorded and uploaded data) and has little ability to recall recent events? Or does he feel the atrophy of his blended memory – the functional combination of his mind, with all its richness of emotional and associative connections, using his digitally-recorded experience as evidence to stimulate connections between present and past? Harris suggests that it is stories that allow us to make sense of our experiences and that modern, “moment moment moment” living disrupts our story-making, creating a disjointed sense of our existence. Yet there is another suggestion here, that too many artefacts also distrupt storytelling by distracting us, refusing to allow us to pause and think about how we might construct a coherent narrative over longer stretches of time. I am left with the question, how do we find a balance between not enough memory artefacts and too many? Free recall of actions. Participants were presented with two lists of 16 verb–noun sentences, each denoting a simple action. For one list, participants were requested to enact each sentence, using the specified object (8 s/item). For example, for the sentence ‘‘lift the pen’’ the experimenter provided the participant with a pen and told him or her to use the object to enact the sentence…A free-recall test of the sentences followed. Number of sentences (including the correct verb and noun) recalled under the enacted condition were entered into the analyses. (Ibid, p. 3). There doesn’t seem to have been enough of a delay (it appears the tests were conducted in the same session as the “episodes”) to allow the actions to enter long-term memory, making this effectively a test of working memory. Also, the written sentences give the participants a semantic hook, meaning that they can answer correctly without remembering their experience of lifting the pen. Other tests included cued recall of nouns and face and name recognition, each of which seemed to effectively require studying some information and then recognising or recalling it less than an hour later. Performance was recorded as a binary measure – participants remembered something or they didn’t. This doesn’t really recognise that episodic memories are constructed with wide variance and, instead, seems to be more of a pragmatic view – was their memory good enough to solve a particular problem? The main difference between semantic and episodic tests in this study seems to be that the episodic tasks were rehearsed (i.e. featured some initial prompting that could then be remembered) whereas semantic tasks involved remembering things that the participant already knew (e.g. synonyms for presented words). Methodology aside, there are a number of interesting issues to think about here. The authors mention studies that support the idea that “cognitive stimulation offered by a partner may protect the brain from deterioration (Van Gelder et al., 2006)” (Ibid, p. 1), that “A rich social network has been related to a lower risk of cognitive impairment and dementia (Fratiglioni, Paillard- Borg & Winblad, 2004; Karp, Paillard-Borg, Wang, Silverstein, Winblad & Fratiglioni, 2006)” (Ibid), and that “having few social contacts and a poor social network is associated with a higher risk of cognitive decline and dementia (Bassuk, Glass & Berkman, 1999; Fratiglioni et al., 2000; Wang, Karp, Winblad & Fratiglioni, 2002; Zunzunegui, Alvarado, Del Ser & Otero, 2003)” (Ibid). This sounds plausible. What I wonder is, if talking about memories improves function or impedes decline, how does our changing use of props (e.g. expanding digital photo collections) or our changing communication styles and media (e.g. remote communication through Facebook) interact with this co-construction of narrative? Mousavi-Nasab et al. imply that the improved performance of married participants is due to cognitive stimulation. But is this the whole answer? What about the effect on cognitive load of distributing memory information to a partner, or the impact of reduced stress or improved confidence that might stem from a healthy married life, or perhaps the indirect benefits from the associated physical health benefits that, at least, males experience from being married? Another question that I am left with is this: if married people have a partner to whom they can distribute substantial amounts of both episodic and semantic information, what effect does this have on their performance in unassisted memory tests? Does it create space for them to remember other things, and what sorts of things are distributed and what sorts of things are not? Perhaps a more interesting study (from my point of view) would be a comparison between how different the two individual accounts of the same event are between married or unmarried pairs. For example, do two friends who attended a wedding produce accounts that are more or less similar than two co-habiting* partners? * Is co-habiting more important that being married in this context? Mousavi-Nasab, S.-M.-H. et al., 2011. The effects of marital status on episodic and semantic memory in healthy middle-aged and old individuals. Scandinavian journal of psychology. Available at: http://www.ncbi.nlm.nih.gov/pubmed/22092006 [Accessed November 23, 2011]. Memory cues seem to belong to that group of concepts that are widely used but lack a clear, specific, common definition. In general, the notion of cues seems to refer to various types of information which support the recall of related declarative (episodic or semantic) memory. In a study of effective cueing for patients with episodic memory impairment, Lee and Dey describe cues as “small details of an experience that help people … recall more of the memory” (2007, p. 132). This implies that a cue will be composed of some element of the remembered experience but the meaning of this is a little vague. I might be reminded of an episodic memory by a thought, or by an object that was not present during the original experience, etc. Could these be said to “be” details of the experience? Or do they simply contain some feature that triggers a phenomenological response similar to one which was experienced at the original event? Further, is there a difference between something that reminds you of an event, and a cue? Cues are often thought of as physical or digital artefacts such as photos, souvenirs, diary excerpts but many definitions would allow spoken words, sensory information such as sounds and smells, and perhaps internalised thoughts. Certainly, a number of studies into cueing used verbal prompts (e.g. Suddendorf, Addis and Corballis, 2009), smells (e.g. Grabbe et al. 2010), or music (Bryant, Smart and King, 2005). A quick search has not revealed any clear direction on what can or cannot be counted as a memory cue. Perhaps a good place to look would be studies into what types of memory tend to be prompted by different types of memory cues. Bryant, F. B., Smart, C. M., & King, S. P. (2005). Using the Past to Enhance the Present: Boosting Happiness Through Positive Reminiscence. Journal of Happiness Studies, 6(3), 227-260. Grabbe, J. W., Mccarthy, A. L., Brown, C. M., Sabo, A. A., Plattsburgh, S., & Street, B. (2010). Olfaction and Emotion Content Effects for Memory of Vignettes. Current Research in Psychology, 6(1), 53-60. Lee, M. L., & Dey, A. K. (2007). Providing good memory cues for people with episodic memory impairment. Proceedings of the 9th international ACM SIGACCESS conference on Computers and accessibility – Assets ’07, 131-138. New York, New York, USA: ACM Press. Suddendorf, T., Addis, D. R., & Corballis, M. C. (2009). Mental time travel and the shaping of the human mind. Philosophical transactions of the Royal Society of London. Series B, Biological sciences, 364(1521), 1317-24. This article is a useful roundup of conclusions from Nancy van House’s earlier studies. It describes the changing nature of the meaning drawn from the “multiple, overlapping technologies” of personal photography: memory, relationships, self-representation and self-expression. (p. 125). I will look at a couple of interesting ideas and conclusions here. One key point the author makes is that photos are becoming better as objects of communication than of memory or, as Assman (1995) might say, photography is shifting emphasis from cultural to communicative memory. The instantaneous distribution of photos to wide networks of a potentially ambiguous audience is more amenable to broadcasting updates or entertainment than to the generation of archives of personally-subjective, context-specific memory artefacts. The flip-side to this may be that the ease and lack of expense of capturing images allows us to capture more mundane or playful moments than previously, generating a record that is, in some ways, more accurate than those which almost exclusively feature us in attendance at special events or on exciting holidays. In reference to annotation (in this case, of physical photo prints), van House suggests that this practice constrains meaning which reduces the “ambiguity and discontinuity” (VH p. 128). This offers, to an extent, a way back from the decontextualisation of imagery that can occur in digital environments through the application of various filters, for example, when we are viewing a list of photographs tagged with the word “dog”. In the case of printed photographs, as van House suggests, the annotations are inseparable from the image. Not so, however, with digital images where annotation can happen in different locations (e.g. different comments on Facebook, Flickr or Twitter) and is attached, in many cases, relatively loosely through metadata stored in the environment rather than within the file of the photo itself. The fluidity between private and public objects means that many archives “may now include images of a person made by others” (VH p. 130) while, at the same time, there is an increase in the number of personal photographs made available for the use of others, even strangers (e.g. in the case of Creative Commons). This is very useful for certain purposes, but the following quote suggests a potential loss in the subjective meaning we derive from our photo collections. “Image-based memory will become more voluminous but less private and more public, based less on local, personal images and more on shared ones. We may see a loss of specificity, of images of local value with local meanings attached, at the same time that people have more access to the collective record. We may lose what Nissenbaum (2009) calls ‘contextual integrity’, an alignment of information gathering and display and therefore meaning within specific contexts.” (VH p. 133). Assman, J. (1995). Collective memory and cultural identity. New German Critique, vol. 69, 125-133. Van House, N. (2011). Personal photography, digital technologies and the uses of the visual. Visual Studies, 26(2), 125-134. Loveday and Conway (2011), while reporting on a study into Sensecam’s effectiveness as a memory aid to people with memory impairments (e.g. amnesia), give an account that is useful in describing how we often remember events. This is one of few articles I have read that attempts to describe fuzzy recall [my term], i.e. the retrieval of conceptual knowledge of past events without accompanying details. Fuzzy recall might be thought of as a semantic “vibe” – the feeling of recognition that something happened but with very limited details on which to pin a narrative. Perhaps we are activating an unconscious perceptual priming mechanism (see Tulving and Schachter, p. 130) which allows us to access a very small amount of semantic memory about the event (e.g. “Yes, I remember that I was there but not what happened“). Loveday and Conway write that “we often have conceptual knowledge of past events without being able to recall episodic details … In contrast, a person who has a relevant cue may recall an episode in detail.” (p. 698). They suggest that without a cue (and, they seem to imply, an external one), “a specific memory cannot be constructed and the representation remains at the conceptual level.” (p. 698). This sounds plausible if we also allow for internal cues such as when one thought leads to another. However, forming a habit of accessing external cues in preference to internal ones (coming up with the memory without the use of physical or digital artefacts) may increase the requirement for such external cues and may reduce access to those memories or associated details for which there are no cues. This objection may be impractical in populations with severe memory impairment such as Alzheimer’s Disease because it is likely to be impossible or, at least, highly demotivating, to attempt to recall episodic details without the use of external artefacts. In populations without memory impairment, it may be worth considering the potential benefits of exerting more effort in our remembrance practices, e.g. the improved retrieval of unrecorded, associated memories. Loveday and Conway also raise an interesting point about the subjectivity of an individual’s perceptions of “vividness” of recall. CR, a patient with profound amnesia, apparently rated all moments of recall as “vivid”, possibly because this was being judged relative to non-cued attempts at recall where no memory was retrieved. An objective vividness scale may be impossible since we are relying on participant’s judgements or on an interpretation of their narratives as expressions of memory. In relation to the effectiveness of Sensecam vs the written diary, Loveday and Conway’s study suffers from vagueness in relation to the nature of the diary entries. Perhaps they are similar to those in the study by Berry et al. (2007), where entries were very non-stimulating descriptions, e.g. “Drive to East Cowes, walk to ferry, ferry to Southampton, taxi to hospital, taxi back to shopping centre, shopping, light lunch, walk to ferry, walk to car, drive home.” (p. 589). In fact, the diary entries in Berry et al. (2007) were written by the patient’s husband, arguably reducing the effectiveness of the associated encoding and reconsolidating process. Berry, E. et al. (2007). The use of a wearable camera, SenseCam, as a pictorial diary to improve autobiographical memory in a patient with limbic encephalitis: a preliminary report. Neuropsychological rehabilitation, 17(4-5), pp.582-601. Available at: http://www.ncbi.nlm.nih.gov/pubmed/17676536. I am attempting to show how we take on different media roles according to the social sphere we are communicating in. The roles are explained further in the posts Media Rolesand Media Roles 2. Please leave a comment on how I might improve the diagram below, including any useful social models you might recommend. For other roles, see Media Roles. As technology changes, photos tend to be consumed in different locations. In the pre-digital era, photos (in the form of albums or prints) would traditionally be shared in a comfortable, social space such as the living room. The emergence of slide projectors meant that people would tend to crowd into a space designed for the projector, rather than the audience. The effort required to set up a slideshow meant that it was unlikely to be set up for one or even two people, but for larger groups. Early digital photography moved photo-sharing to the computer, often a heavy desktop machine in a workspace or office. This was not necessarily set up for comfortable, social reminiscing and again, people would crowd around the computer with the sharing tool determining the location rather than those doing the consuming. More recently, mobile devices with improving screens, connectivity to online photo collections and communicative functionality (i.e. the ability to send photos to others) is leading us to once again share digital photos in comfortable social settings. In fact, it may go further than the traditional sharing of printed photos since we now have access to large photo libraries wherever we go, meaning that we can share our photos in cafes, parks, public transport, etc. We did this to some extent in the pre-digital era, but it was unlikely we’d have more than a photo of a family member or two in our wallets. Simplified photo printing through hardware, software and 3rd-party services (e.g. Apple’s iPhoto allows simple ordering of canvas prints, books, cards, albums etc) is leading to a resurgence of displaying our photos in printed forms on the walls of our homes or on the desks in our offices. This has become somewhat rarer in the early digital era because we did not have ready processes for retrieving particular photos from our storage areas and process them easily or inexpensively into a satisfactory physical product. We are also starting to display our photos in places such as the wallpaper or screensavers of our computers and mobile devices so that we are constantly looking at a few of them very often. Whereas photos of a spouse or children on our desk at work or on a wall at home would serve as a reminder while we were in those spaces, we now have these constant reminders with us in all locations. Also, in the pre-digital era, we would have looked through one person’s photos, then perhaps reciprocated with our own set. Now, when browsing online collections, links often take us from one person’s photo to the photo of another. Indeed, the photos of different people are often merged into a particular collection, perhaps through direct collaboration (e.g. by consciously gathering them together or uploading to a set) or through more indirect means such as tagging (people, places, events, etc.). By looking at more fluid photo collections, the Consumer’s focus changes – perhaps spanning a greater number of subjects (e.g. by browsing through the collections of many different people) or perhaps fewer (e.g. if we just look at collections of Paris or from the year 1960). When shown or given a photo by another person, we often give feedback on the subject matter, the artistic flair, etc. The Critic’s role, too, is changing due to technological affordance. As well as commenting face-to-face, comments are now also added as short messages which appear beside or below a photo on Facebook or Flickr. These messages can form part of a conversation between Critics who may or may not know each other but who will generally know the Creator. Sometimes their responses will be in the form of another photo. (show example). The types of comment may also change based on the medium of expression. For example, the public nature of such comments (for example, Facebook comments have a much wider and more unknown audience than a face-to-face chat in your living room or an email to a select group of people. This will affect the content and style of the comment. The temporal dimension of such a critical discussion is also changed by the affordances of the medium. A Flickr or Facebook discussion might continue at infrequent and irregular intervals over a period of years, with the entire discussion visible to participants. Contrast this with face-to-face discussions of a photograph. It is possible that this discussion, too, might be contributed to over many years but its nature will be very different, probably with more total words but no clear record of what has been said previously. This role might be thought of as being performed by agents that help with minor aspects of the creation and distribution process. These might be people but could also be technological affordances (e.g. the automatic mode on a camera sorts out the flash for you, or the device keeps track of the date that photo was taken). In fact, this is probably increasingly being outsourced to machines and it is perhaps the change in this role that is allowing such an explosion of photography and media sharing. The tools needed to capture, distribute, review, share and store, now fits in our pocket, meaning that we don’t need other people to help us move things around. The logistics of distribution are minimal. Technological barriers which arise may require someone with technical know-how to explain the possibilities and processes for performing particular aspects of modern practices but generally the visibility of this role is diminishing. People engage with memory artefacts as part of a personal, evolving identity formation project (van Dijk 2007). Whenever we capture, review (and reflect upon) or share mediated memory, we are continuing the process of constructing ourselves. The production and consumption of any media involves some general roles that can be applied to personal memory objects such as photographs, home videos or diary entries. Dividing our individual memory practices into the roles of Creator / Performer, Director, Producer, Editor, Gatekeeper, Distributor, Archivist, Consumer, Critic and Production Support enables an enlightening perspective on the way these practices are changing through engagement with technologies that automate, extend or alter their component processes. If we take personal photography as our model, the above roles (derived from Foulger 2002) might be described as follows. Note that, in this case, many of the roles will be performed by the same person, possibly at the same time. The creator directly uses tools to forge the media object. This would probably be the person taking the picture. The performer influences the content directly through action. When taking a photograph, there is a performance by the people in the frame and the person taking the picture. Arguably, performance is part of the creation process. Closely linked to the role of Creator. The Director essentially decides on and guides the process of creation (e.g. the person who decides what the photo should be of, who should be in it, where they should stand, etc). Organises the overall project of producing and distributing the photo. Makes changes to the photo after the initial creation. Controls the access to photos. Shows or gives photos to others. Stores, categorises, organises etc collections of photos. Reflects on and provides feedback on aspects of the photo. The development of point-and-click cameras allowed more people to take photographs with minimal learning, essentially widening access, introducing new perspectives and expanding the market for new technologies. Technologies such as Sensecam or CCTV allow an automatic creation process, though arguably the setup of these tools was implemented by a person in the Creator role. The sensibilities of Performers are changing as we are exposed to more photographs and to the experience of being photographed, yet the mechanics become less obtrusive and, therefore, less visible to us. For example, we are constantly being photographed by tourists, satellites, security cameras, webcams etc, and our performances are probably becoming more natural and subconscious. Directors are generally becoming less selective about what they photograph and how many photographs they take. The purposes of photos are also changing, with many more photographs being taken as communicative memory (i.e. for the purpose of keeping in touch through evoking the present rather than the past) due to instantaneous and inexpensive distribution channels (email, multimedia texting, photo-sharing websites, etc). When we make decisions about how do we want to record, manage or distribute our photos, we are playing the Producer. Although this role seems to be more relevant for larger media productions (e.g. movies), perhaps it has become so because technology is taking care of many of the decisions we would previously have had to make, such as file formats, lighting equipment, or even just remembering to take the camera with us. Editors are probably more common in personal photography now because the entry point for photo editing skills has been lowered by advancing software and usability. If we include meta-data and associated media (e.g. descriptions, comments, links etc) then the role of Editor may also include modifying these aspects of a photo. The Gatekeeper of personal photos has traditionally tended to be the matriarch whereas digital photo collections are now more likely to have a patriarchal gatekeeper (Nunes?). Note that gatekeeping is not necessarily to do with privacy concerns but may involve overcoming technical barriers (e.g. where the photos are kept or an overall security password for digital files) or simply a process aimed at avoiding boring the Consumer or showing them poor quality media. The role of Distributor is changing radically from someone who would show friends and family a physical photo album or perhaps send a small number of select photos in the post, to someone who broadcasts large numbers of photographs to a wide community via email, sms, Facebook, Twitter, etc. The poor Archivist’s job is becoming more and more daunting as the decreasing expense of production allows Directors to experiment, taking and re-taking hundreds of times more photos than they might have in the pre-digital age. Collections are created from a wide range of sources – my photos, my family’s photos, some from friends, some from unknown sources, possibly some from strangers on the Internet. In many cases, the Archivist simply dumps files onto a hard drive (or leaves them on the camera or memory card) and then relies on a Gatekeeper to be able to find them (Van House 2009, pp. 1078). Regarding Consumers and Critics – this really deserves its own post. The changing nature of photo consumption is actually central to the initial study I plan to run. Technological affordances create triggers or barriers for the adoption of these roles. For example, automatic modes allow more people to be Directors, while daunting new online interfaces may lead the role of Distributor to be passed from a parent or grandparent to a more tech-savvy member of a later generation. 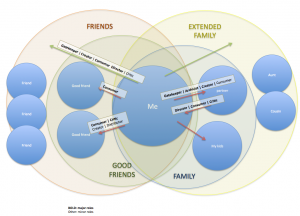 We also adopt roles differently within different social spheres (which I am thinking of as smaller than ecological communities such as Bronfenbrenner’s (1979)). For example, I may be the gatekeeper at home (by knowing where the files are or having the knowledge of how to download them from the camera) but my wife may be the one who uploads photos to Facebook, thereby controlling the access of our friends and social network. Bronfenbrenner (1979). The Ecology of Human Development: Experiments by Nature and Design. Foulger, D. (2002a). Roles in Media. Presented at National Communication Association Summer Conference, May, 2002. Nunes, M., Greenberg, S., & Neustaedter, C. (2008). Sharing digital photographs in the home through physical mementos, souvenirs, and keepsakes. Proceedings of the 7th ACM conference on Designing interactive systems – DIS ’08, 250-260. New York, New York, USA: ACM Press. van House, N. (2009). Collocated photo sharing, story-telling, and the performance of self. International Journal of Human-Computer Studies, 67(12), 1073-1086. Elsevier. van Dijk, J. (2007). Mediated Memories in the Digital Age. Stanford, California: Standord University Press.